Helping People All Around The World... Obtain Another Chance! 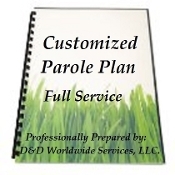 Thank you for choosing D&D Worldwide Services to help you pursue a favorable decision from the Parole Board. Simply select the Full Service logo and we will begin immediately! Don't Forget... The Parole Review Process Starts Early!